How do I disempower the microaggression: “People with foreign names should be in the dictionary with their picture in it.” ? Firsthand, I see how stereotypes and microaggressions occur daily within multicultural communities, unchecked, uncorrected. As someone who identifies as Vietnamese American and has a name that is non-anglicized and tonally pronounced, I have found the experiences growing up were that of isolation and have felt condemned to certain opportunities that were granted to my peers who had anglicized names. One particular yet memorable moment where I had been confronted with insidious aggressions left me shocked and confused. The statement read, “people with foreign names should be in the dictionary with their picture in.” It wasn’t until later that I was able to process the hurt and anger inflicted in that moment however, the opportunity to confront it had long passed. This feeling and experience is just one of many similar narratives for people of color with “foreign names”. To challenge and change that narrative, I decided to disempower this microaggression by deconstructing the statement and designing it to be visually comprehensive. What makes a name foreign? So I started an ongoing project to educate and facilitate an open conversation around microaggressions, the pronunciation of names, and the personal narratives that are attached to them. I’ve been able to collect and finish over 30 name dictionary pieces and have exhibited and created an open dialog around the topic across four shows. The project remains open for more submissions with the ultimate goal of creating an actual dictionary to be presented online or in physical form. Join the Conversation - Submit Your Name. Microaggressions are very subtle but the feeling that leaves the person experiencing it is very strong. So the microaggression written out in bold was the first thing that I wanted people to read so that it would incite an emotional reaction whether it was anger, curiosity, sadness, shock, or even laughter. To incorporate all of these name dictionary pieces together to create an intentional experience, I decided to collaborate with Together We Create (TWC), a collective of arts educators and graffiti artists who provide hands-on experiences in graffiti murals for youth. TWC helped me build the space so that it mimicked the outside world of graffiti on walls. The reasoning behind this is because graffiti is negatively associated with hate speech and vandalism. I wanted to help these artists in changing that stigma. So it made sense to use these graffiti pieces as a framing to the name dictionary pieces. The ultimate intention is for the viewer to enter in the space and associate the environment with a negative context, especially when you can directly see the hate speech spelled out on the walls. 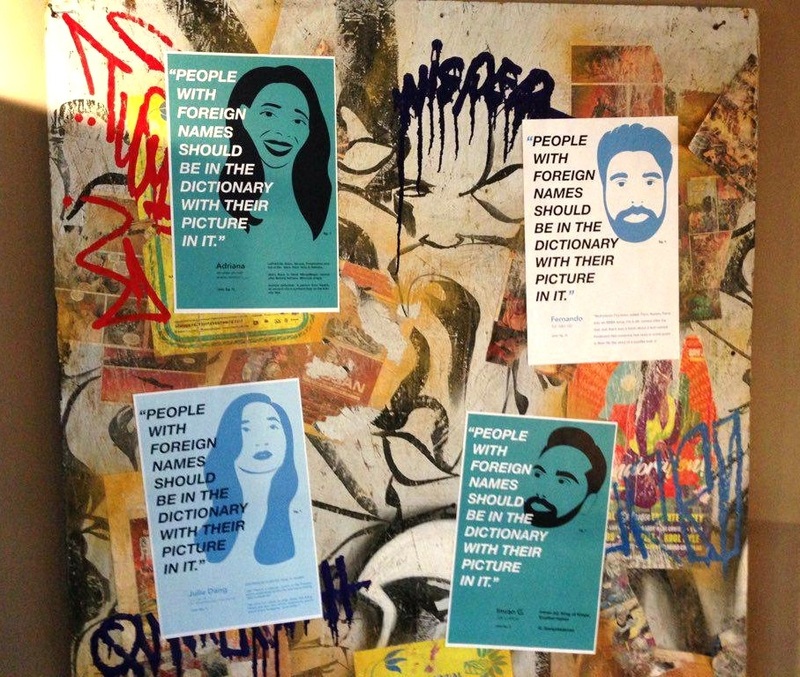 When they look closely into the pieces, they will discover that these graffiti pieces actually give a platform for people to disempower the microaggression and in turn, empower their names through their personal story. Mesngr (left) and Wisper (Right), muralists and graffiti artists from Together We Create, adding the finishing touches to the Name Dictionary backdrop. Just as the microaggression states, I designed the format of the learning experience to incorporate similar elements as you would find in a dictionary such as phonetic spelling, images, figures, and definitions. Designing the name piece in a format that is commonly recognized for most people allows for the viewer to learn how to pronounce the “foreign name” as well as learn about the individual narrative just as they would open a dictionary to learn about a new word. The second most prominent element to the name pieces is the person itself designed as a graphic figure. The reasoning behind this is to show that microaggressions, though subtle, directly affect those experiencing it. Below the graphic figure is their name, phonetic spelling, and definition that is either a true definition, direct translation, or a short personal narrative about the individual. The reasoning behind this was to show that behind a “foreign name” is a unique and complex individual who should not be left to feel isolated because of their given name. They deserve to be seen as a person who is deserving of opportunities that have been limited to them.